Some companies, especially the bigger ones who get inundated with candidates or those who need to fly in candidates as the position may be overseas find it so expensive to conduct face to face interviews but thanks to internet based video technology such as Skype employers can now interview candidates around the world. It is simple, cost effective and fast. 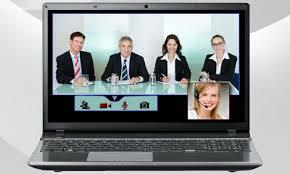 Upwards of 63 percent of those in human resources conduct interviews via video conferencing. Many companies and businesses are looking to start or increase using video conferencing as a way to interview potential candidates. While many companies are using video conferencing and others are looking into it – it is still quite unfamiliar territory for interviewers and job seekers alike. You need to almost *set the stage* so to speak so you can create a positive experience for both you and the interviewer. One of the first things you need to do is to choose your location – thanks to the invention of Skype interviews can now be conducted not just through a computer or laptop, but via smart phones and tablets. Where you are during the interview doesn’t matter, but ensure you are dressed appropriately – just because it’s a video call doesn’t mean you can stay in your pyjamas. Dress as you would if attending a face to face interview – including having a shave, doing hair and makeup and dressing accordingly. Be aware of what is behind you and what will be *in shot* so to speak, try not to have posters or *mess* around you that the interviewer might find distracting. If you are the interviewer, remember too, that this video conference is like a window into the company, so make sure your location is quiet and free of distractions. You could always consider using a conference room or similar. Let your co workers know what you are doing to avoid any interruptions, treat the conference the same way you would treat a face to face interview. Take time to consider or imagine how you want the interview to look and feel more natural – make sure there is ample light and that your face isn’t in a shadow. Avoid sitting behind a window as you will end up in silhouette, its better having the light on your face and trying to reduce any glare or shadows. Where possible avoid leaning into the camera – this can create a distortion. Look directly into the camera and not your computer screen when talking. In a face to face interview keeping eye contact is important, so it is no different during a video interview. Consider too that there could be time delays and technical difficulties, while it is inconvenient it does happen and can be down to the speed of your internet connection and what traffic is currently running on the company’s internet connection. Even under the very best conditions delays and drop-outs can be expected – you can work around this by not moving around too much and by speaking slowly. Allow for time delays as well, so wait a few seconds before asking or answering a question – this will help you avoid the confusion and awkwardness of talking over each other. If you have never participated in a video interview before don’t jump in unprepared take some time to practice with a friend or family member (this can help you get your settings and background right). Always be prepared for technical difficulties and try not to let them affect you or your concentration. Have your resume and any questions just out of sight, but handy if you need to refer to them, take a deep breath before the connection is made and relax. Have you faced a video interview before? What helped you relax? What was the experience like for you?